I receive a lot of questions and comments regarding the true cost of building a boat from scratch, full size patterns, and kits. Since I track time and materials closely, I have found that building from kits makes a lot of sense from an economic stand point. I took some discussions with customers/potential customers and put together this PDF on the 'economics of kits'. In a nutshell, the cost of building from a kit is not as much more than building a boat from scratch as people think because of the extra plywood required to build from scratch not to mention the time savings. 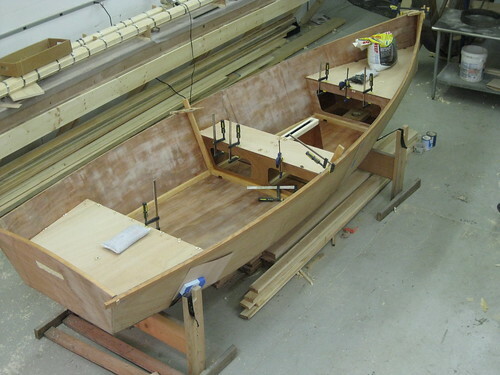 In the meantime, we are making progress on the first professionally built Goat Island Skiff (yawl version) which will be at the Maine Boatbuilder's Show in Portland on March 18-20th. Please stop by. We'll be in building 2 near the stairs up to food court. When I post next, I'll have a PDF link that goes into more detail about how the designs/kits are produced in CAD and CNC cutting. I am a believer in epoxy encapsulation of wood; I wasn't always. Encapsulation entails coating the wood with multiple coats of epoxy, saturating the wood surface and building up a moisture-barrier. The moisture barrier is key for bilges and underbodies as it keeps water out of a laminate and maintains a more constant wood moisture content in timbers. 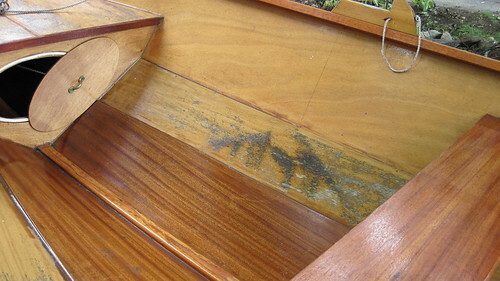 Wood movement and ingress of water is what often gives wooden boats a bad name: high maintenance. Encapsulating forms a stable base for varnish and paint. We tell customers to expect a 10 year life for their paint. After 10 years of normal use they may need to do a fresh coat. That is as good as any fiberglass boat maintenance. 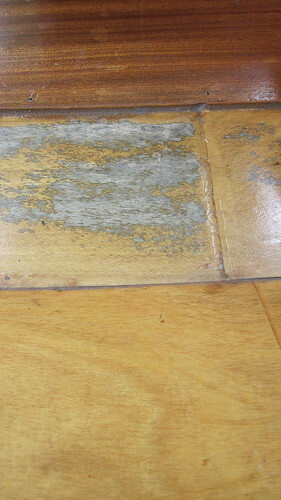 What convinced us of the merits of epoxy encapsulation was a visit to my friend Steven's house. He has a faering he built with his son that shows the effects of different plywoods and of epoxy coating wood. You can see three panels in this Faering. 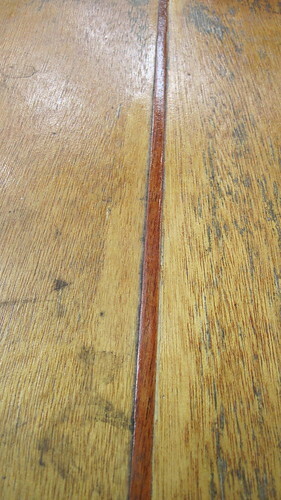 The darker plank is Joubert Sapele faced Okoume (varnished), the middle strake is Okoume by Joubert, and the lower plank in the photo is Shelman Okoume. All planks are finished with a Behr spar varnish. This is the same boat closer up to one of the tanktops. It is Joubert Okoume. The neighboring plank is Shelman Okoume. Both were varnished the same. The tank top is more degraded and molded than the plank. The tank top along the edge of the plank is perfectly clear. This strip was inadvertently epoxy coated when the squeeze out from the glue joint was spread during the clean up process. 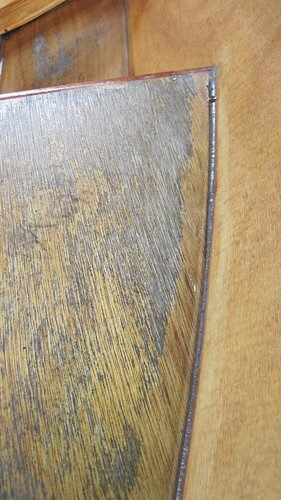 The same thing happened in the next photo: can you see where the epoxy is? The results? It is clear that the epoxy coated areas of plywood are making the plywood much more durable and holding up much, much better. The sheer strake is probably holding up better because it is higher in the boat and receives less foot traffic and a lower angle of sunlight upon it. The middle strake and tank tops get more direct sunlight. But the different brands of plywood may have to do with the difference between planks made of Joubert vs Shelman. It is too bad Shelman went out of business. Clearly, Sapele holds up great and Steven made a good decision putting it in as the garboard. With that said, I have also seen Sapele planked boats flake and shed paint after many years and these were boats that were not epoxy coats. The moral of the story: epoxy encapsulation is a good thing.